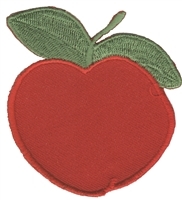 8371 - apple embroidered patch - 1.125" tall x 1 1/16" wide - Sew on or iron-on. Carded for a display rack for retail stores. 8359 - Grape. Aetz embroidered applique. Sew on or iron-on patch. Patches are carded for a display rack for retail stores. Made in USA. 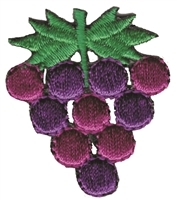 8370 - Grape bunch embroidered applique patch. Sew on or iron-on. Patches are carded for a store display for retail stores. Made in USA. strawberry embroidered applique (patch) - .625" x .875"
strawberry embroidered patch - 1.375" x .875"
8369 - strawberry embroidered sew on or iron-on patch - 1.375" x .875" - Patches are carded for a display rack. Made in USA. 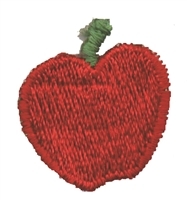 8356 - apple embroidered iron or sew on patch. 2.875" tall x 2.625" wide - Patch has an iron-on backing but can be sewn on. Patches are carded for a display for retail stores.